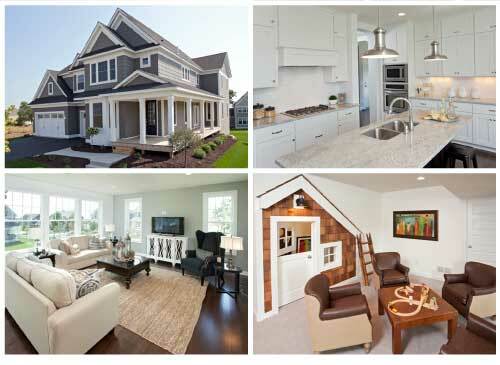 If can you only make one stop on the Fall Parade of Homes tour, make it our Westfield model in Lakeville, MN! This dazzling home has award winning design set in Lakeville’s most unique neighborhood, Spirit of Brandtjen Farm. Inspired by the farmhouse style, the Westfield seamlessly blends old world charm with the latest in architectural trends and flexible spaces. A wrap around porch graces the home’s entry and brings unparalleled curb appeal (seen top left corner photo). Appealing inside and out, this two-story, five bedroom, four bathroom floor plan boasts nearly 4,700 square feet of living space. Step into the Westfield’s main level and tour the study and farm-style kitchen (top right corner photo)that opens to a great room with a wall of windows and a two-sided fireplace. The center stairs draw you to the upper level with a spacious laundry room, bonus room, three bedroom suites, and a luxe owner’s retreat with spa bath. To top it all off, the Westfield has a finished walkout lower level with a custom play “house” for children (lower right corner of photo). This home provides ample space for your family as well as entertaining. The must-see Westfield is listed at $699,900. Homes by Tradition not only features custom homes, but a custom experience for each of our clients. Our attention to detail and quality is unmatched. Learn more about our process. If you’re ready for tour, come see us during the Parade of Homes Thursdays-Sundays September 7-29 from 12-6 p.m. Don’t worry if these times don’t work for you! Contact one of our experienced new home consultants at 952-322-8700 or by email.